When most people think of state-of-the-art modern infantry fighting vehicles, only four countries usually come to mind first: Russia, the US, England and Germany. These countries produce the BMP-1/2/3, Bradley IFV, Warrior, and Marder series vehicles in those classes to be sure; but they are not alone. While most other countries so far do not earn the publicity of the “Big Four” there are a number of other contenders such as several vehicles from China, Ukraine, Belarus, and Sweden. 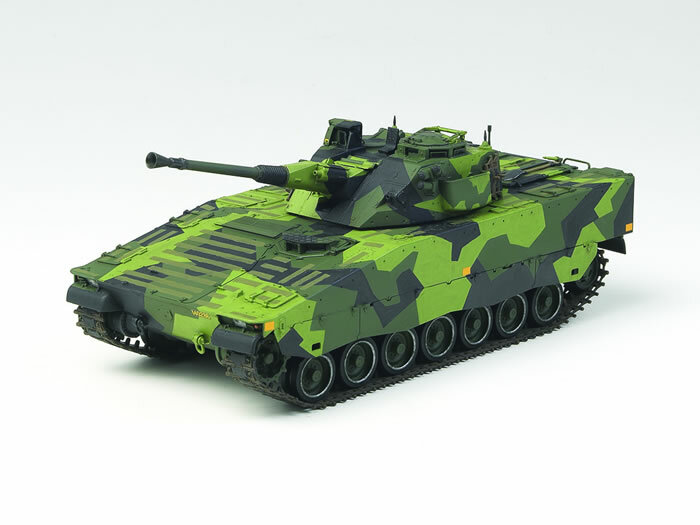 The latter has produced their vehicle series, the CV9040, for over 15 years now and more than 1,000 have been produced for Denmark (45), Finland (102), Netherlands (192), Norway (104), Switzerland (186), and of course Sweden (509). 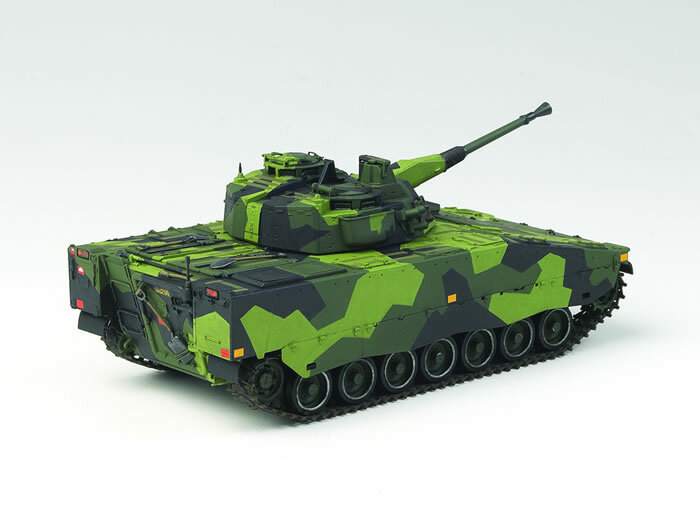 This vehicle began life as a Swedish military tasking levied upon the Haegglunds company to develop an infantry fighting vehicle in the early 1980s. 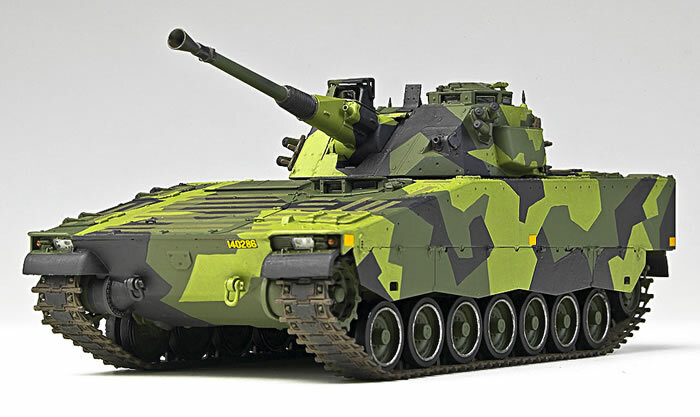 Five prototypes of the new vehicle, dubbed the CV90, were ready for testing in 1984. 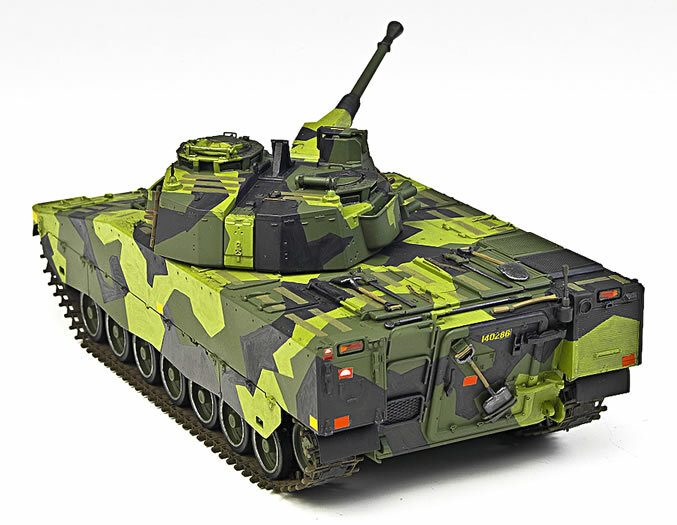 After seven years of extensive trials and testing of optional configurations, armament and other systems, the vehicle was accepted for service with the Swedish Army in 1991. The first vehicle armed with a 40mm Bofors gun, the CV9040, was handed over in November 1993. 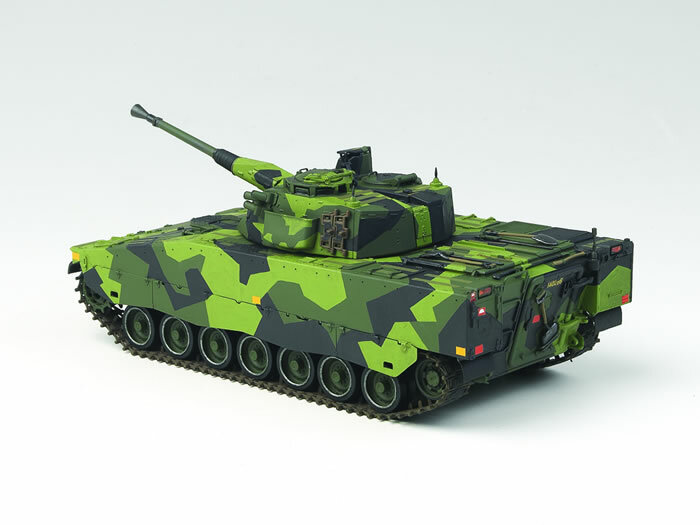 Since then there have been several variants of the vehicle bought by the Swedish Army as well as those sold abroad; the CV90 can mount a wide variety of armament to include a 30mm US “Bushmaster II” chain gun (CV9030), the CV9035 with a 35mm “Bushmaster III” gun, the CV90105 with a rifled 105mm tank gun, the CV90120-T with a tank turret and smoothbore NATO type 120mm gun, CV90120-T: Equipped with tank turret and smoothbore 120 mm gun, the CV9040 AAV (TriAD) air defense vehicle with radar and a gun with increased elevation, the CV90 Command Vehicle, CV90 Forward Observation Vehicle, CV90 (BgBv90) Armored Recovery Vehicle and a proffered CV9056 Bofors RB56 anti-tank missile carrier which was not purchased. Each export series has been adjusted to the using country’s standards and is suffixed as such (e.g. 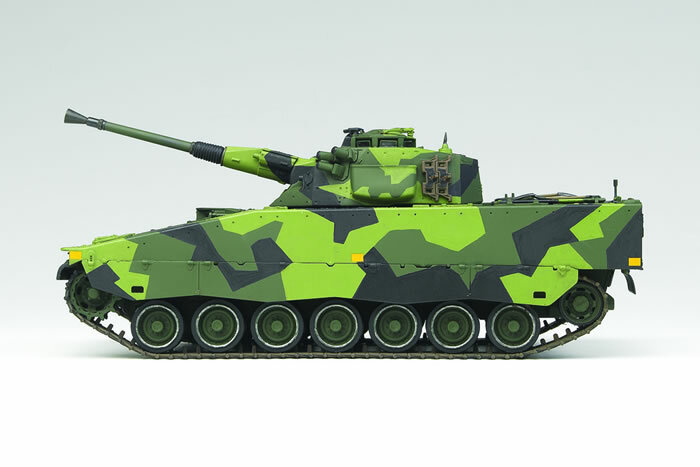 CV9030 CH for Switzerland, CV9035 NL for the Netherlands). 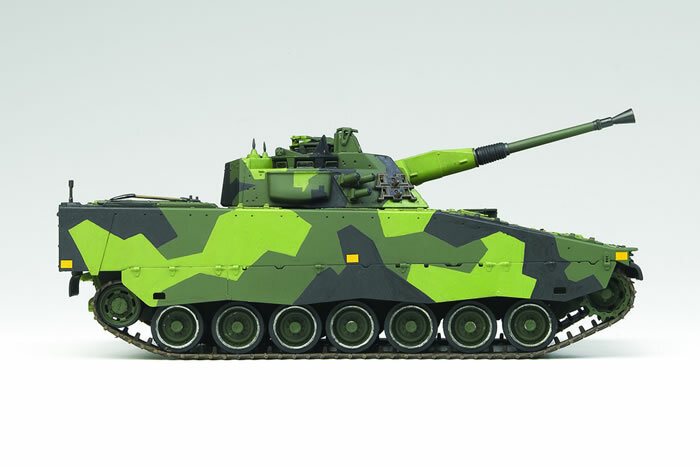 South Africa has also apparently trialed the CV9040 turret on its 8 x 8 Rooikat series of vehicles. 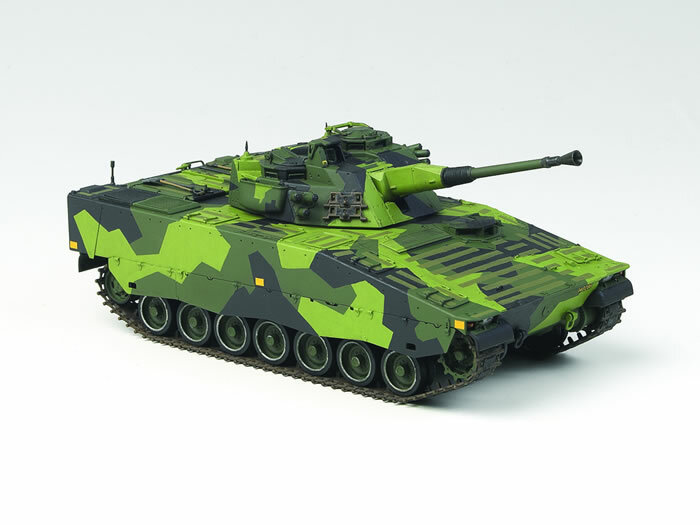 There are four basic variants of the CV9040: the based (1993) model; the CV9040A, which added a stabilized sight and gun to provide fire-on-the-move capability; the CV9040B, which added the Vehicle Command and Control System (FUM/SLB is the Swedish abbreviation for the system) and the CV9040C which is modified for use in peacekeeping operations. 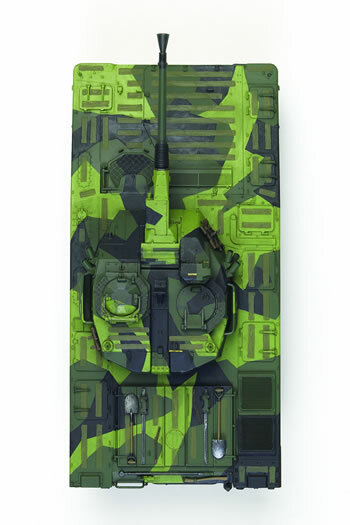 The CV9040B which is the subject of this kit is armed with a 40mm Bofors L/70B gun which can now fire APFSDS-T ammunition, HE-FRAG, and various rounds optimized for antiaircraft/anti-helicopter suppression. It also has a 7.62m coaxial machine gun, six smoke grenade launchers, and may be fitted with two 71mm illumination flare launchers at the rear of the turret. It has a crew of three (driver, commander, gunner) and carries a seven man dismount team. It is a “medium” IFV as it comes in between the BMP-1/2 (13-14.7 tons) and the heavy Bradley (29-32 tons) and Marder (29-32 tons) classes of vehicles. Academy has had a run of good luck lately with vehicles from smaller armed forces such as the IDF and ROKA kits (Merkava IV, K1A1 tank, K9 Thunder howitzer) and this kit happily comes from that line. 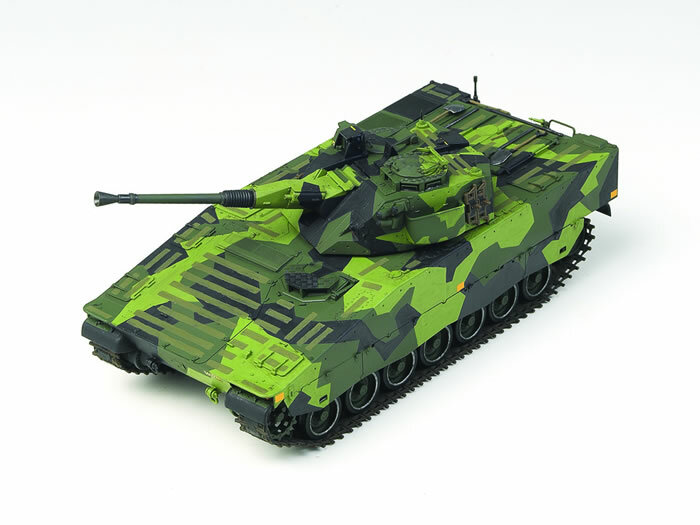 While I plead that I am not intimate with the CV9040, the model appears to match all of the photos and plans I have and the Jane’s coverage of the vehicle. 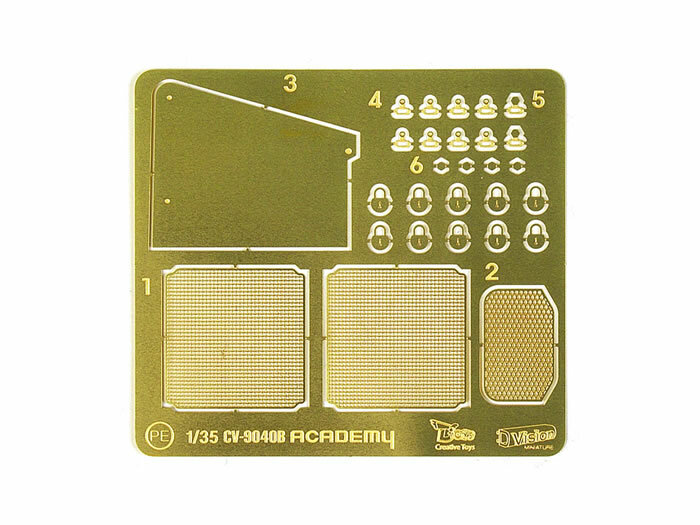 All of the main hatches are separate parts, several options are provided for the kit, and as with most of the recent Academy kits it comes with a matching set of crew figures (here the commander and gunner). On the negative side, there is no interior detail whatsoever – the 40mm gun rests in a cavity with sealed components so there is little to see there anyway. All of the hatches are without any internal detail and what inner surface they have is peppered with ejection pin marks. Anyone who wants to scratchbuild an interior will have to line them anyway so that may not be a major problem except under the main engine access hatch. Assembly is straightforward. In the case of this vehicle, surprise! The now familiar and annoying oval hole in the belly of all “motoritis” Academy kits is gone and a flush square plate is provided to seal the opening. No cuts are found over the final drive slots so this kit may not have a motorized compatriot. Steps 1 and 2 cover the suspension and lower hull. There is a small pin (F8) that cements in the back of the road wheel arms (F9/10) which apparently is the axle. Nice touch! 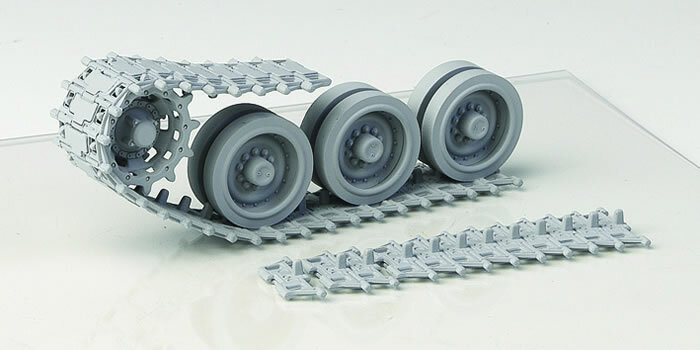 The wheels are installed in step 3 and are pretty conventional (two halves and trapped vinyl “keeper”) but the other row of road wheels has a separate tire and rim (F12) to simplify painting. Note that while the tires are black both the painting directions and box art show white rims! The lights are installed in Step 4 and have clear styrene lenses; as they are rectangular it is difficult to replace them with any commercial lenses that I know of. The stern plate and details are installed in Steps 5, 6 and 7. This includes the access hatch (E52) but note that it is one of the few hatches which has interior detail. (There’s still nothing to see inside, however!) The modeler has a “DML” choice of a solid access ladder step (E46) or a frame (E45) with an etched brass insert. In Step 8 the assembly of the upper hull begins with the installation of the driver’s hatch (which has no interior) and the engine hatch and radiator grille assembly. While the latter has two etched brass screens oddly enough the engine air intake (E57) is a solid plastic part. The driver’s hatch may be left operational, so it is a shame it has no interior. Assembly continues in Steps 9 and 10 with more hatch covers for the side stowage bins and the OVM rack on the upper crew access hatches (E60/63 and E62/63). An etched brass applique is added to the right rear outside of the hull and also requires etched brass bolt heads (PE6) and bracket loops (PE5) added to it. Steps 11 and 12 cover the basic turret structure with separate clear viewers (J1), whip antenna bases, and details added as well as two bins and a case at the rear of the turret. In Step 13 the outside bits are added to the turret, such as the smoke grenade launchers, spare track links, and what appear to be stowage “pouches” (for lack of a better term) on the sides of the turret. In Step 14 the commander’s and loader’s hatches are installed, but these again have interior detail. They also may be made to work. Step 15 covers the installation of the gunner’s multimode sight and its details. Step 16 covers the assembly of the Bofors gun and provides for either a single piece slide-molded styrene barrel (D25) or a turned aluminum barrel with three styrene detail parts (D24/26). Either one mounts on the breech assembly of the gun, which then drops into the turret cavity where the side mounts (D30/31) trap it before the turret base (C2) is attached. A partially folded canvas cover (D16) then mounts on top of the gun breech. From what I can tell it gives the gun about 15 degrees of elevation (the TriAD version can go up to about 70-80 degrees from photos, but that may be coming in a later kit). Step 17 covers the crew, but while the rest of the directions are clean and refreshingly easy to follow after DML efforts in this case the figures are shown assembled and with painting flags attached. 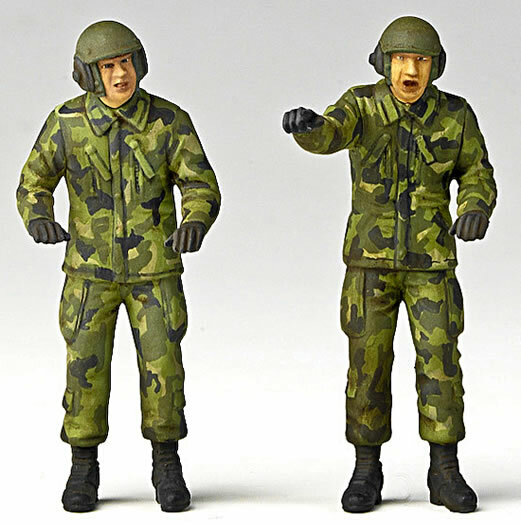 Each figure consists of a body, separate boots, arms (one witha separate hand) and heads. Step 18 is everyone’s favorite – tracks. Here the modeler has a choice of either using the single vinyl runs – nicely detailed if a bit thin – or the two-piece single link tracks. Each link comes with a separate pad, again to simplify painting, and link. They are not working tracks. Each side takes 84 links per the directions and since 86 are provided it leaves four for sacrifice to the “Carpet Monster”. As the kit I received was a pre-production shot I did not receive a set of decals. Painting directions are provided for the very bright Swedish “splinter” pattern for one vehicle, registration number 142041. I am not sure if more come on the decal sheet as the box art is for vehicle 140154. 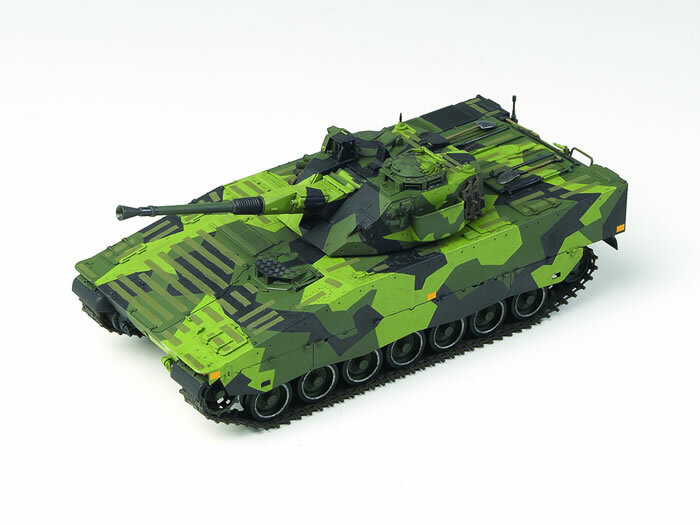 In summary, this appears to be a lovely kit and one that will compliment Swedish Strv 122 (Leopard 2A6) tanks on any fan’s shelves.